This time of year I like to revisit old images and sometimes edit them with newer tools. This is one of the first images I ever took with a cell phone. When I returned to Pittsburgh five years ago one of the first places I visited was Market Square which had changed dramatically in my 35 year absence. One thing that seemed unchanged was The Original Oyster House. I took this image while sitting at the bar. It was in color but thought it should really be a monochrome image so I edited it with the NIK Silver Imaging tool. A lot of people don’t like day lilies because they grow wild by the road side. I really like them though and over the years we have planted many different colors. The trick is thinning them out and controlling them. The first year we returned to Pittsburgh we planted Bleeding Heart. It has always been a favorited of ours. In our mountain garden we had a ugh specimen. It reminds me of an upside down version of the wild flower Dutchmen’s Britches. This one has grown significantly in three years and is now the size of a small shrubbery. There are many good reasons for wishing Summer lasted all years. Comfortable weather, fresh produce at community markets and beautiful gardens are just a few of summer’s benefits. 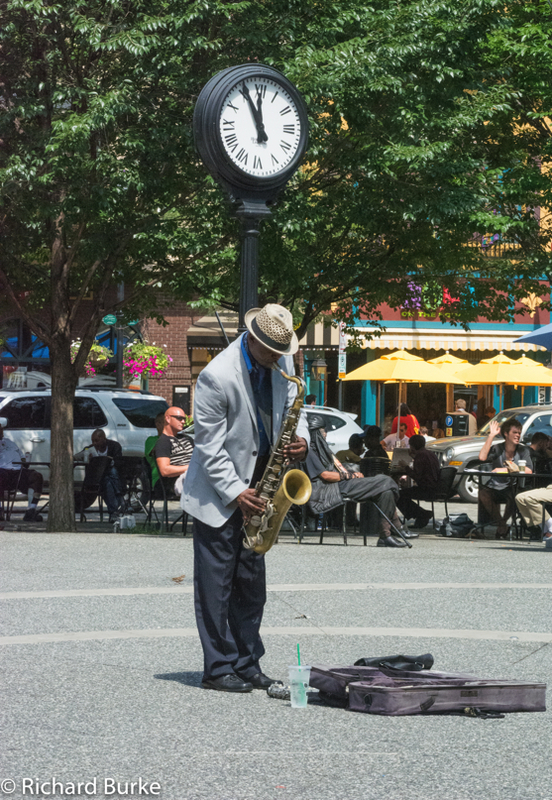 I also love the plethora of street musicians that pop up in parks, squares and sporting events. Some are great and some are not so good. This guy serenading the lunchtime crowd at Market Square was quite good though. I wonder where he goes in the winter?